originating from the Hollywood Palace Theater (formerly the El Capitan) onHollywood Boulevard. There was a revolving guest host, usually a singer or comedian, each week. It was broadcast on the ABC Network. 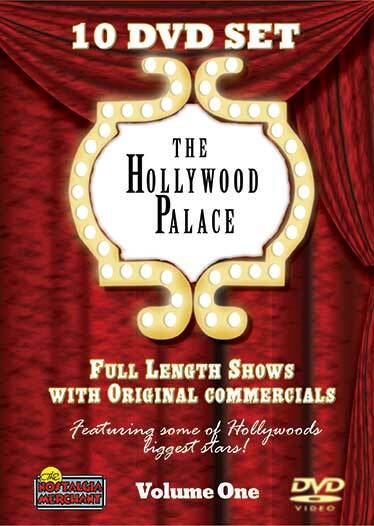 This is a 10 DVD Set of hour long original shows including the original network commercials. Quality is Excellent. Disc 1 – Donald O’Connor, Buddy Greco, Don Knotts 2/1/64; Disc 2 – Nat ‘King’ Cole, Diahann Carroll, Paul Winchell 3/21/64; Disc 3 – Maurice Chevalier, Jane Powell, Tim Conway 10/3/64; Disc 4 – Petula Clark, Noel Harrison, Lynn Redgrave 10/17/67; Disc 5 – Buddy Ebsen, Jack Carter, Willie Mayes 10/31/64; Disc 6 – Gene Barry, Olivia de Haviland, Bette Davis 11/7/64; Disc 7 – Victor Borge, Alice Faye, Nancy Wilson 11/14/64; Disc 8 – Arthur Godfrey, Dorothy Collins, John Gary 11/21/64; Disc 9 – Van Johnson, Sergio Franchi, Betty Grable 12/26/64; Disc 10 – George Burns, Wayne Newton, Connie Stevens 2/13/65.